The River Lune meanders through a stunning landscape of lush pastures and ancient stone villages in North Lancashire, many of which feature historic churches and characterful traditional pubs. The River Lune finds it source at Wath, in Ravenstonedale, Cumbria, at the confluence of Sandwath Beck and Weasdale Beck. It flows through south Cumbria, meeting the Irish Sea at Plover Scar near Lancaster, after a total journey of about 44 miles (71 km). The river derives its name from a Celtic word meaning "clean" or "pure". The Lune valley provided poetic inspiration for writers such as of Thomas Gray, John Ruskin and William Worsdworth. When the art critic and philanthropist John Ruskin first saw the Lune Valley, he declared "I do not know in all my country, still less France or Italy, a place more naturally divine or a more priceless possession of the true Holy Land..."
Locations such as Crook O’ Lune, a shepherd’s crook-shaped bend in the river, moved the landscape artist J M W Turner to produce numerous rustic masterpieces. The Crook O’ Lune (pictured left) is situated near Caton, four miles from Lancaster, is a popular and highly attractive spot, where the River Lune meanders in a large curve through tree-lined banks, the view up the valley is superb, looking north east to the plateau of Ingleborough. The river passes under Penny Bridge and the bridge which once carried the Lancaster to Hellifield railway line, which now forms part of an extensive network of cycleways and footpaths. 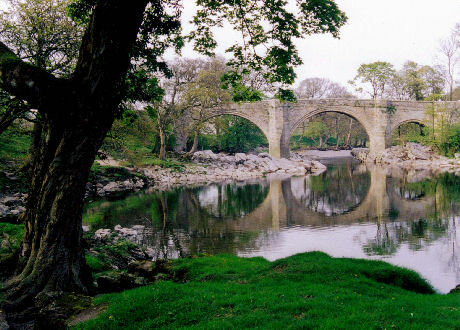 Bridges over the River Lune include the picturesque Devil’s Bridge near Kirkby Lonsdale and the Lune Millennium Bridge at Lancaster. The village of Hornby boasts a castle dating back to the twelfth or perhaps thirteenth century. Hornby Castle (pictured below right) is an imposing Gothic structure which dominates the landscape from its commanding position above the River Wenning. The attractive nearby village of Wray, is famous for the annual Wray Scarecrow Festival. which attracts tens of thousands of visitors each year. The Scarecrow Festival was established in 1995 and takes place every year during the week leading up to May Day when there is a fair. The completely unspoilt village of Whittington has a spectacular old sixteenth century church, built on the remains of a Norman motte and bailey castle, a pub, the Dragon's Head and quaint, quiet streets. Gresgarth Hall Garden near Caton has been owned by the Gold medal-winning landscape designer, Arabella Lennox-Boyd since 1978. The beautiful garden features terraces, lakes, a small bog garden, a wild garden, an extensive kitchen garden, a bluebell wood, the Millenium Wood, the Rhododendron Hills, the herbaceous borders and a serpentine walk. The coastal resort of Morecambe lies on the coast of Morecambe Bay, just to the south of the Lake District National Park, the largest expanse of intertidal mudflats and sand in Britain, covering a total area of 310 km square. Morecambe Bay is amongst the most important wildlife locations in Britain, boasting miles of sandy beaches and is famous for its incredibly fast moving tides and treacherous quicksands. Guided Cross Bay Walks are available with the Queen’s guide, Cedric Robinson MBE. The large Lancashire coastal village of Bolton-le-Sands, located about one and a half miles from the town of Carnforth is well worth a visit, while Carnforth itself is a popular base for walkers and cyclists exploring the area. Carnforth Station Heritage Centre covers the important railway history of the town features and there are a host of high street shops and cafés. Award winning Leighton Hall is the lived-in house of the famous furniture making Gillow dynasty and is situated to the west of the village of Yealand Conyers, just outside Carnforth. The present Georgian style building was constructed by George Towneley in 1759–61. The Flying Staircase is an exceptionally fine example of the early Gothic revival, with long dlicate pillars supporting a landing and framing a beautifully curved stone staircase. 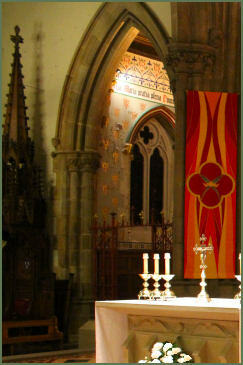 The family chapel features a fine late eighteenth century Gillow altar front. 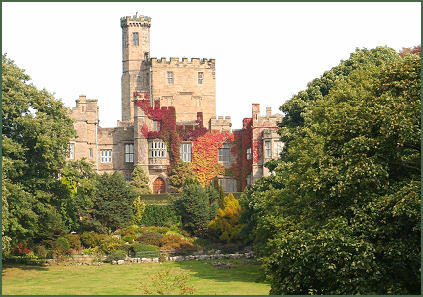 The romantic Gothic towers, acres of beautiful gardens and trained birds of prey annually lure thousands of visitors. As well as the house and grounds, with extensive views of the Lakeland Fells, Leighton has a children’s play area and caterpillar maze, plant conservatory and charming tea rooms. Silverdale is situated on beautiful Morecambe Bay, near to Lancashire's border with the neighbouring county of Cumbria. It forms part of the Arnside and Silverdale Area of Outstanding Natural Beauty, which boasts a rich diversity of habitats and wildlife. The area has many pleasant wooded walks around Arnside Knott, where the National Trust graze Highland cattle, up to the famous "Pepper-Pot" at Silverdale, built to commemorate the Golden Jubilee of Queen Victoria, alternatively the coast at Silverdale offers cliff top walks and sea views. Historic Lancaster, the county town of Lancashire, was founded by the Romans. The Roman fort, built during one of the many revolts in the north of England instigated by the rebellious Brigantes tribe, was situated on the hill where Lancaster Castle now stands and was built by the end of the first century AD, and possibly as early as the 60's. It was rebuilt in stone around 102 A.D. and remained active into the early fifth century. The Wery Wall and Roman Bath House, a surviving fragment of the Roman fort at Lancaster, is situated on the east slope of Castle Hill adjacent to the rear of Mitre House. 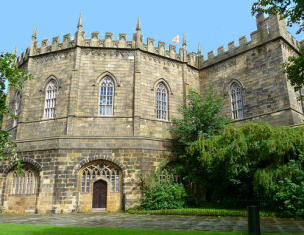 A monastery was located on or near the site of today's Lancaster Priory (pictured right) on Castle Hill by the 700's or 800's. Cynibald's cross, an Anglo-Saxon runic cross was found in the churchyard of the Priory in 1807 and is believed to date to the late 800's, it is now displayed at the British Museum. Most of the magnificent interior is medieval, but there are traces of a Saxon church. The oak choirstalls with their rich woodcarving and carved misericords date from 1340 and are the third oldest in England, John Ruskin described the fretwork on the stalls as 'the finest in England'. Lancaster Castle (pictured right) may have been founded in the eleventh century on the site of a Roman fort overlooking a crossing of the River Lune. The castle which we see today dates in part to the middle of the twelfth century, when the great Keep, otherwise known as the Lungess Tower, was built on the site of an earlier tenth century motte and bailey castle.The castle was gradually enlarged thrroughout the Middle Ages, reflecting its importance as a defensive structure and a centre for the administration of justice. The infamous Pendle Witches were imprisoned, tried and hanged here in 1612. During the 1745 Rebellion the Young Pretender, Bonnie Prince Charlie passed through Lancaster on his ill-fated march south to Derby. 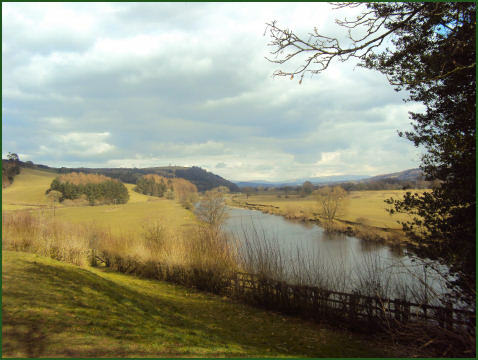 The Lune Valley Ramble is 16 1/2miles (26.5 km) in length and follows the course of the River Lune’s lower reaches through some of the finest lowland scenery the North West has to offer. Bounded by high moors, limestone hills and shadowed by the distant peaks of Ingleborough, Whernside and Leck Fell, the route offers excellent, easy walking and is signposted and waymarked. The walk commences at the railway station in the historic city of Lancaster (SD471617), passing the famous beauty spot of the Crook o'Lune(SD521644) it finishes at the attractive market town of Kirkby Lonsdale in Cumbria (SD615783).